While talking with a customer at work a few years ago, they gave me a tip for how to reduce the amount of junk you receive in your mailbox. 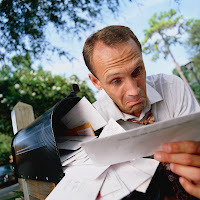 I'm talking about all the credit card applications and unwanted solicitations. Tip: Instead of sending the provided envelope back with your application/money, you stuff it with your extra junk and mail it back. Blake and I tried this out for awhile. I did it more because I thought it was funny. I can only imagine the delight of the person opening up my envelope full of pizza coupons and check order slips. It's kind of a pain, not to mention maybe a little rude, but I did notice a slight decrease in the amount of junk mail we received. I love it...I'm going to do that. Before the do-not-call registry, I also liked asking telemarketers for their home phone number so I could call them back.